VISTA GRANDE SUBDIVISION is a first class overlooking residential subdivision located at the hilltop of Bulacao, Talisay City, Cebu, Philippines. At Vista Grande Subdivision, enjoy the breathtaking view of Talisay City, Cebu City and the Cebu Strait that will take you in the grand view of interesting mountainscapes around a well-planned community, and a panorama of the Alta Vista golf fairways. It provides the conveniences modern living and the advantages of the blend of sea-valley-mountain location. Overlooking lots in Vista Grande Subd., Bulacao, Talisay City, Cebu..The subdivision entrance is along the main high way of Talisay City. 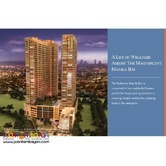 Wide city and sea view.. lot sizes 150 sq.m. to 250 sq.m., prices 8,200 per sq.m. to 13,500 per sq.m.